Ireland, like the rest of Europe, is experiencing a participation decline in its democratic system. This has been noted by many political experts across the world. A simple Google of “democracy” and “failing” will produce some eye-opening results to start with, exposing this. Before we go forward however, in brief, it would best again to refresh the mind to the various types of democracy there actually is. You have five defined forms of democracy that could be used. The sixth is a mish-mash of some or all of them. 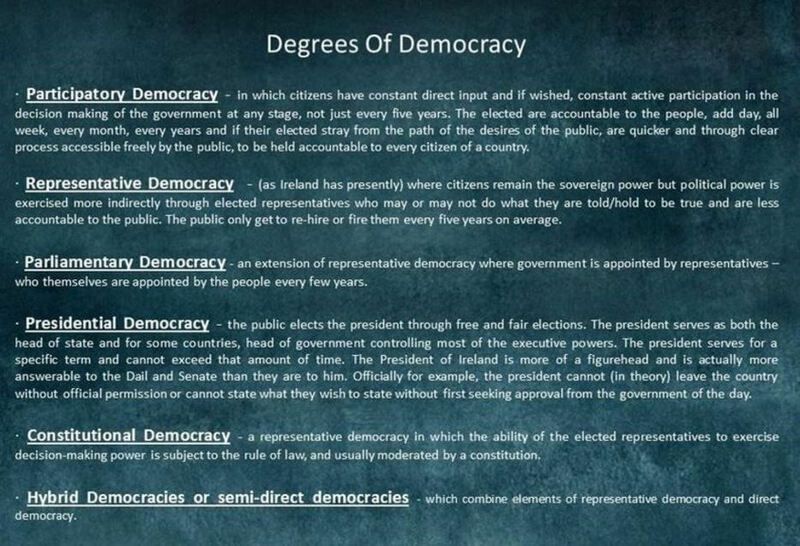 Currently Ireland is based around the Representative Democracy system. How has that really worked out for Ireland! One has been a significant and accelerating rate of democratic breakdown. Second, the quality or stability of democracy has been declining in some large and important emerging-market countries, like South Africa, Thailand, and Bangladesh. Third, authoritarianism has been deepening. And fourth, the advanced democracies have been performing rather poorly and seem to lack the will and self-confidence to promote democracy effectively abroad. One kept quiet example of how democracy has been undermined can be seen when it comes to one country alone in Europe – Germany. What’s that? It’s only an agreement that German politicians previously, secretly signed up to. So what? It blankly allows foreign secret services such as the CIA and the NSA (for example) to have free legal rein, to bug the hell out of the German people. They of course, are not supposed to know all this. Their sovereignty like Ireland’s, is supposed to be solid and safe. When it became exposed that USA agencies have been continuously bugging everyone all across Europe and its institutions including even EU offices, Angela Merkel public protested to her people in 2013 saying “Spying among friends – thats just not on!” …Was she (a) playing to the masses (b) suffering from memory loss as to the existence of the agreement or (c) so dumbly uninformed that every one of her advisor’s ought to be sacked? The agreement still exists to this day so surely she would have known about it? As Germany’s leader, if she didn’t know – then who really would in the German government? One thing is for certain, the German media has been saying very little about it and the half-hearted USA investigation into their own bugging actives, are saying even less within any reports. On the face of it, like Ireland, sovereignty rights are supposed to be exclusive to the country that hold them. However, when secret agreements and trade deals are rammed in quietly upon people, how honest and true is that sovereignty? Frankly, how honest is that county’s democracy? In the case of Germany, democracy again was quietly weakened. Like Ireland’s sovereignty, Germany’s too was actually being directed or undermined by others beyond one’s own borders! 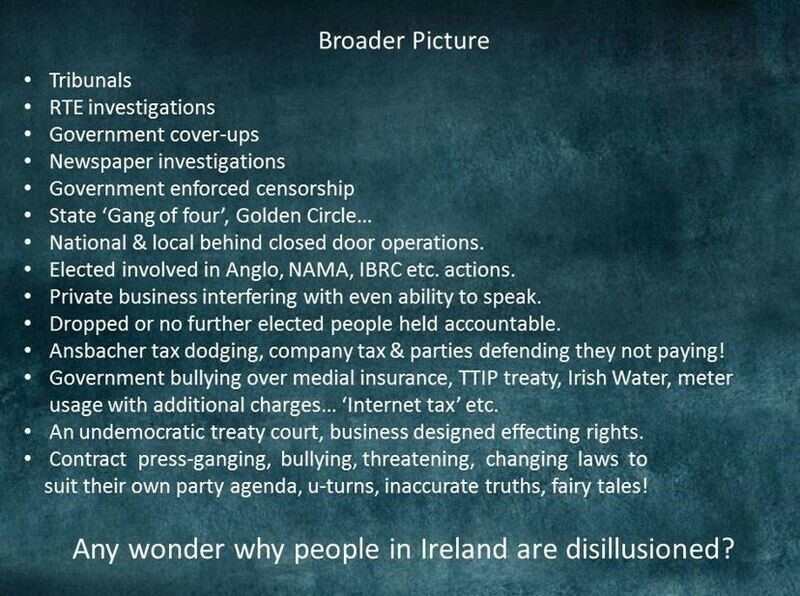 Elected too within the state were (like Ireland) continuing to facilitate outsiders to see it quietly directed or controlled. Of course, again, the population of those effected are not supposed to know all this and those with their agendas are saying nothing – perhaps fearing a voter wrath over seeing their sovereignty integrity weakened and perceived elected traitors working from within their own elected houses of power. Germany is just but one of many European countries that could be examined and within, have reasons in it found, for the continuation of a recognised weakening democracy. Last nine years, more countries declined in democratic freedoms than have improved. Factor of two to one or more. Since 2005, 29 of the forty-nine sub-Saharan African states declined in freedom, while only fifteen countries improved. A number Arabic states unrest and overthrowing their governments, religious systems of government or dictatorships have kicked in. Democracy has been seen to fail, be undermined or considered very ineffective. Russia – China – North Korea – Cuba- Saudi Arabia – Vietnam – Bahrain – Morocco – Syria = states of other systems that people are more looking towards and wondering about. In short, to add to the above, people in Europe and beyond it has seen just how good Representative Democracy in particular has not only been weakened by business and lobby groups but also by its undermining even from our own political representatives. Some countries have started to look at other ways to run a state. Some have already alternative ways such as China, Russia etc. Some have religious based governments, equally bad as others (not all), are in no rush to adopt the democratic way when they look and see how ours alone is still turning out stuffed with corruption and more! The way things have gone on in Ireland this last twenty to thirty years, could anyone blame others from not rushing into seeking a Representative Democracy way elsewhere? Be truthful! The antics that has gone on in Ireland (that we even know of) is the stuff of soap operas which, if put into a TV script, would be then left out as it might be considered too far-fetched! 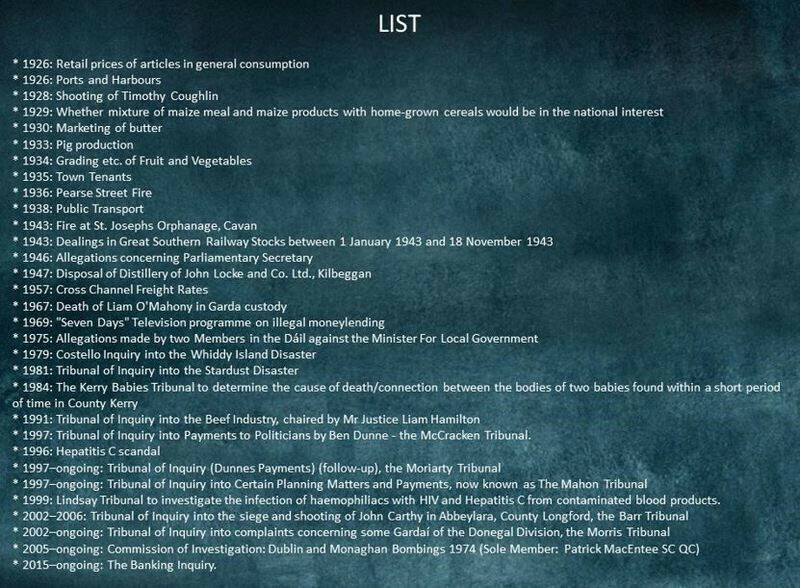 Yet, the people of Ireland are living through it still. Government perceived bullying, legal threats, actions or media words that had been dished on citizens, has been judged by many as unfair and often very undemocratic. The antics of many from the usual round of (out-dated?) parties has been non-ending and there has been no will to hold their elected to account. There is always PR talk about doing it – but when it comes down to it? Little or nothing done? The Standards in Public Office (SIPO) department cannot independently investigate matters they might catch quiet wind of. Political parties will not pass legislation to allow them to do so. Everything has to be first official lodged by external people only. Irish Water (yes, that fiasco) is not answerable to the National Ombudsman and the political parties set-it up (deliberately?) that way. Parties are in no hurry to change that either. One wonders why? The public has been bullied into contracts, forced into monopoly operations, threatened and repeatedly only told half-truths – and sometimes a lot of lies to boot! Government has ordered that secrets surrounding abuses be state buried for decades. Big tax cheats (Ansbacher for one example) have been quietly let off. Named? Not a single one seen an Irish court room? If you are a much smaller tax owing person – you will be in there in flash and/or media exposed! …Or if don’t pay your TV licence? Dodgy politicians from all sides have never been held to account. Won all the money on the horses – seriously? What colour was the cash winning envelopes? Complete fairy stories invented by elected for home and away ears – repeatedly. Complete refusals by elected to talk and debate with their very own voters in genuine live debates. Undemocratic? Only when they want your vote – then they cry “democracy in action”. Before and after that however? Debates avoided even within their own area! Private business individuals getting loads of state contracts – giving money to politicians prior to contracts, giving money to parties, reaping by coincidence, many rewards later and then hiring those that earlier could have been helpful? Sound familiar? The incidents go on further. To add to the past antics, political parties are now setting the legislative stage so that more is going to be forced upon the people. Through bodies set-up that already are ineffectual in addressing the non-trickle down of supposed economy wealth, others are setting up Ireland for a further invasion from outside of legislative uncertainty. The TTIP Treaty is a trade agreement that has many aspects in it that will weaken Irish democratic ability to further legislate. The treaty will undermine national and local ability to challenge those with bigger wealth behind them from beyond Irish borders and the people’s safety will be but at risk by lower quality standards not also including GMO imported foodstuff. Farming, industrial and even ability to govern all, under quiet legal attack. More and more national government, county and local council contracts are being farmed out to private enterprise. Where once the state ran things, had the employed manpower to carry out duties from own employed workers… now those people are being let go from councils and even government departments. They are being replaced by the hiring of private companies to take over where others have been let go. Leased workers and zero hour contracts slide in! Its privatisation of state services by the quiet, back door legislation – and a nation of people are not supposed to notice – but many have thankfully. Council work – contracted out. Social services work – contracted out. County management services – contracted out. Hospital services – contracted out. Housing of homeless – contracted out. Maintaining our road networks – contracted out. In all of this happening, your local or national politician is appearing to have a lesser say, sometimes lesser to be responsible for – but their basic pay (in 2016, being upped by €6,000), their expenses and their (multiple?) pensions seem to be ever growing in contradiction. Their ability to be accountable to a people they are supposed to be working for and answerable to, has become more volatile and unreliable. They appear with each year to be more able to ignore what their own elected are telling them is wanted. They can ignore what is really needed, ignore what has been asked of them to produce and then furthermore, able to dictate to citizens downwards – all while riding out a term of their individual office. The elected, answerable to the people once in really only five years, seem to gaining in pocket (in office or rewarded after for previous favours done? ), giving away more, not to the people they are supposed to really serve and people often unable to hold them to account for it all. Those still elected won’t hold Garda investigations where many is needed and instead hold PR expensive useless inquires where even there, the remits of what can be said, who can be named and what evidence can be produced, is deliberately limited. That’s on top of a government deliberately stacking an inquiry board in its numeric favour to aid they getting their agenda way! The public has seen this and more! It’s all on record. 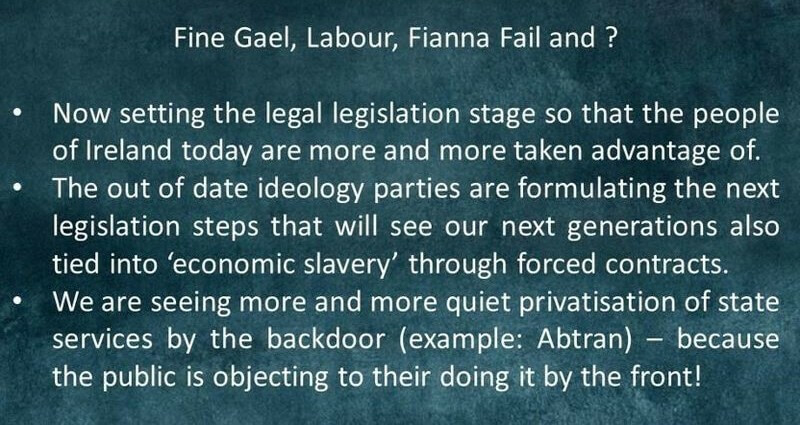 It is no wonder that a new democratic practise has been thought needed for Ireland. Other people than those in the Dáil, have seen a not just a possible way to stop the further decline of the democratic process. They are urging for a way that goes beyond fortifying Ireland and Europe’s democracy from outside ideology attack. They are seeking the instigation of an improved form of democracy. One that will address the needs of the people to have a greater say – one that can operate faster to social and economic factors. They seek an improved process that allows greater public ability to hold the poor quality elected, more accountable before they can bring more social and economic damage to a nation and single individuals. Representative Democracy not just in Ireland is being seen to be failing but it is being seen in same light elsewhere in Europe. The solution it seems, is to improve it – and that improvement to many is called “Participatory Democracy”. Instigated now in Switzerland 150 years, starting in Iceland, Greece and more, the desire for it is growing. This is where citizens have constant direct input and if wished, constant active participation in the decision-making of the government at any stage, not just every five years. The elected are accountable to the people, constantly more for every month, every year and if their local and national elected stray from the path of needed or desires of their voting public, they are quicker, through clear defined process, far more accountable to every citizen of a country – even town! This system of democracy is one of course that present day ageing politicians don’t like. The fear of them being more accountable to their actual voters must strike quiet fear in their hearts. All their lined up possible antics and previous ones too could be under threat of being complete stopped, exposed or unable to further carry out. The excuses used for declining its instigation of course won’t mention anything of this. Other reasons will be tried sold to the public as to why it’s should not be instigated. If they cannot think of a good reason to decline Participatory Democracy, they instead with favouring media, decline to give Participatory Democracy further publicity as a topic to be debated or mentioned. If it’s not mentioned – they public don’t know about it. 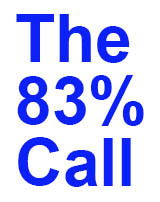 If the public don’t know about it – the public cannot call further in mass numbers, for its instigation. This might explain why Participatory Democracy, being a top item (83%) called for at an Ireland National Constitution Convention, was buried as a topic within an eventual state end report on the convention. Instead of the Fine Gael and Labour government giving the people the top thing they asked for at it – the coalition instead completely ducked it quietly and gave the people an expensive wasteful referendum on the age of presidential candidates. Important to note also that a president’s position is a ceremonial job in Ireland – so only comes with occasional signing power. Even there, the people can’t have anything which might affect more regular political antics, stopping them or exposing them? So with even RTE aiding the non-mentioning of a public call for Participatory Democracy, with government elected also aiding the non-mentioning of Participatory Democracy, with an equal biased newspaper media doing the same, the vast majority of the people stand less chance of finding out about it, asking questions and then possible thinking “We actually need that right now!” State censorship by deliberate omission and its worked previously. Still is? Some of the people of Ireland however are not unaware of what poor quality elected are doing or in some cases, not doing! They have joined together in a number of groups to carry a new message forth – that there is a better way! 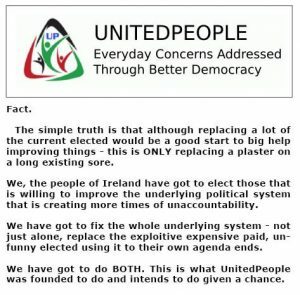 Some, like UnitedPeople, have even gone and registered with the Dáil as a new party, to try bring in the much needed legislative change required. Other groups too are calling for Participatory Democracy. Other new political parties like the Irish Democratic Party are also seeking the top most item asked by citizens. The idea that there is a better way to stop the current political rot has taken hold within an already large amount of people. The notion of Participatory Democracy is not going to be easily put back into its quiet box. many Irish people have awakened to its crucial advantages. Current out of date, corrupt, pocket filling politicians will try continue deny the idea of Participatory Democracy any further oxygen to grow. Thankfully there is more and more out there daily learning of it in other ways. The truth is also that politicians are supposed to give the people that which they seek. Are current elected politicians doing that? Including the instigation of Participatory Democracy? If they are not doing that but keeping quiet – are they really working for the people or against them undemocratic? Should they then be re-elected for their ways? One thing is sure. Presently the Representative Democracy system is failing. It is not just I saying it. It has been said and still is being said in many political think-tanks, observing bodies and high education establishments in Europe and beyond it. If those that are involved in the democratic way wish for it to longer survive, they must stop direct weakening it or by intransigence, allowing it to be weakened. They must re-enforce it instead and let the people better govern it and those governed by it. REMEMBER: A chain is only as strong as its weakest link. Think of the people as those links in a united democratic chain. If they decide to more opt out from something they think is not working for them, the democratic chain – or system breaks. Many ‘links’ are weakening already. Some have already decided to opt out and our active democracy participants are lessening across Europe Ireland. Each cannot afford much more loss? Look at the bigger picture. The world is experiencing a new wave of other ideology terrorism. We can either sit back, do nothing and pay an eventual price at home and possibly away. Our own democratic system must be made better to survive the faults within and the attacks from outside. We simply cannot do nothing. Our children’s future will be decided by our present actions – or in-actions. Choose wisely in all things. What we do or don’t do, will have ripples towards tomorrow. * Footnote: Ireland has been part of the European community still being spied upon. This has officially started from year 2000. It’s been operated at USA/UK level as part of the then titled “Echelon” operation. This is an invasion of privacy upon everyone, that still continues care of GCHQ in England and Langley, USA (with other off site locations). Ireland’s neutral status once again has been devalued via a secret agreement with American and British governments – without checking -in democratic-wise with the Oireachtas, Seanad or Irish public. Up and running is a state-of-the-art, global telecommunications spying apparatus consisting globally of for starters, 120 satellites and ground stations. Some of these ground stations are deliberate set-up by the USA outside its own nation to clear skip around own its laws. Germany for example, has spy listening stations built and operating for the USA alone and more. The public again in these countries, are not supposed to know this or just how much their democratic state is still being undermined by what can only be seen as manoeuvres of controlling “Big Brother”.